Hello, lovely ladies! 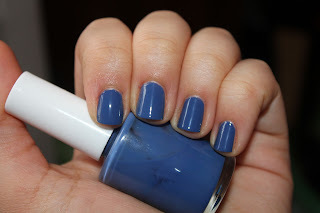 Happy Sunday:] Today I have for you my take on Chanel's Les Jeans polishes. Cremes are pretty and all, but totally not my favorite finish of polish. So the Chanel Les Jeans polishes just didn't call to me at all... especially when considering the price! And the Nubar versions of it didn't float my boat enough either. But I got some frankening supplies recently and realized that I haven't made a creme in a loooooooooong time.. So I naturally I had to fix that! :] I call this one Jeggings, since it's based on the jeans polishes, but nooooot exactly, heehee. I had it on at 3 coats:] this franken is suuuuuper shiny and dried really fast! It's definitely the NYC Extra Shiny Top Coat I use for my frankens. Seriously, it's awesome. If you franken and don't need a suspension base, get this stuff!! :] That's my 2 cents lol. So how was everyone's weekend??? Mine was completely unproductive [but relaxing!]. P.S. Fingers, Amanda, and Rach: this one's for you;] I know you girls love your cremes! Also wouls love to send you your own Australis Green if you really wanted it? thanks so much! & YESYESYES. ahhhhhhh i'm soooo excited!! That color looks amazing on you! And thanks for the shout out! Yay for cremes! thanks! i've never gotten a chanel [though peridot sorely tempted me], eventually there will be a dupe that wears better on people. I love this!!!! Gotta love a good creme. And the color is gorgeous!! !